Daily Positive (D+) is a not-for-profit media initiative to accumulate, store and publish positive news from all the countries of the world. D+ collects news for each of the 365 days of the year and spreads notable, extraordinary and uplifting information from each culture. Its mission is to engage global citizens in interesting, thought-provoking dialogue about trending news topics through positive, open concept journalism. Any registered user of D+ can add and edit news to D+ pages. Each of its news content is curated and researched by international researchers, independent journalists and community contributors. D+ is also synonymous with different blood groups, such as, A+ and B+. Blood is the essential substance of life as is positivity. D+ aims to ensure the circulation of positivity in the world community at a time when it's most needed. 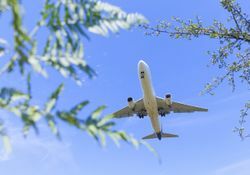 Joint BioEnergy Institute researchers demonstrate that jet fuels made from plants could be cost competitive with conventional fossil fuels. With an estimated daily fuel demand of more than 5 million barrels per day, the global aviation sector is incredibly energy-intensive and almost entirely reliant on petroleum-based fuels. Unlike other energy sectors such as ground transportation or residential and commercial buildings, the aviation industry can’t be easily shifted to renewable energy sources using existing technologies. This page was last edited on 25 April 2019, at 00:05.